This past Sunday I prepared a quick and easy brunch — Bagel Sandwiches with Herbed Cream Cheese and Fresh Tomatoes, some fruit salad, and Blood Orange Mimosas. 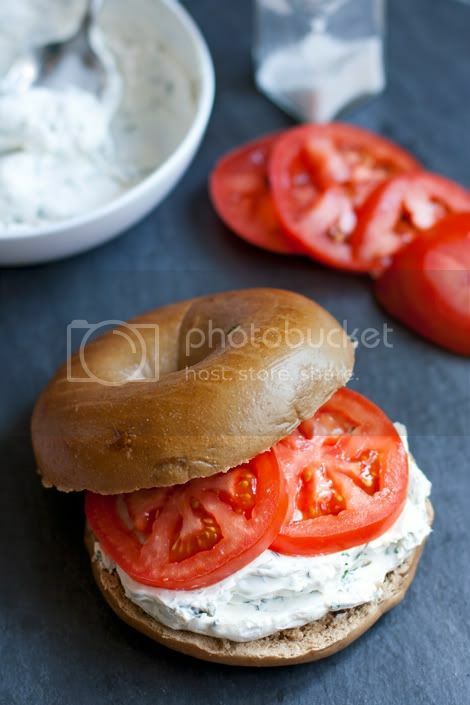 The bagels with herbed cream cheese and tomatoes couldn't have been easier but they were so enjoyed. There's no need to buy pre-made herbed cream cheese — here's how you can make your own fresh (vegan or vegetarian) in a pinch. Prepare the cream cheese spread: Spoon the Tofutti or cream cheese into a medium bowl. Add the chopped basil and chives, and mix everything together with a spoon until the herbs and cream cheese are well combined.